With the label (jLabel), we can display unselectable text and image. We can give the label various characteristics such as multiple lines, multiple fonts or multiple colors by specifying html code in a label's text. Label are not opaque by default, turn its opacity property to "true", if you need to paint the label's background. Assume: we have created file Frame01 as following archive 001. THE BEGINNING. Add 4 labels in panel, hold SHIFT + click, when adding a last label release SHIFT, just click. Select fourth label, hold SHIFT + drag then surround four labels. 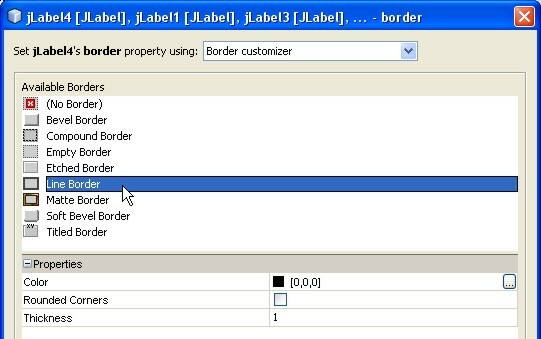 In tab Properties, subtab Other Properties, property border, click button … If there isn't border property, so click one jLabel, then repeat selecting 4 jLabels. 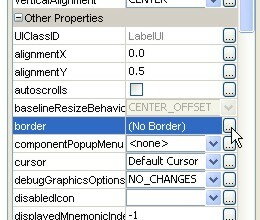 In dialog select Line Border, click OK. 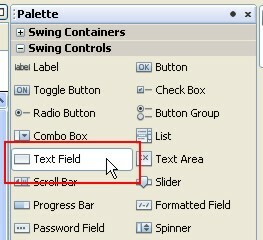 Right click jLabel1, select Edit Text, then type This is the first, hit ENTER. 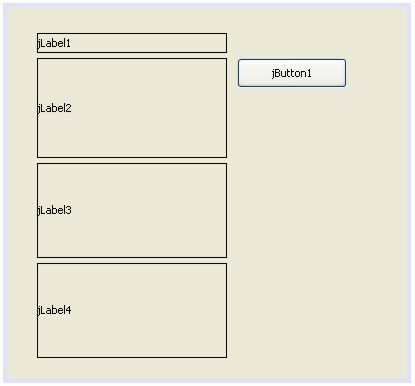 In tab Properties, subtab Properties, property horizontalAlignment, select CENTER. Property background, select yellow. Though 've been OK, the viewing doesn't change, cause opaque property is false. Subtab Other Properties, checked opaque property. 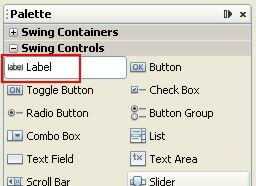 Right click jLabel1, select Change Variable Name… named lb1, click OK. In mode edit, type “This is the second with multiline and multi-style”. Hit ENTER. But, there are not multiple-line and not multiple-style. you 've to do that using html script. 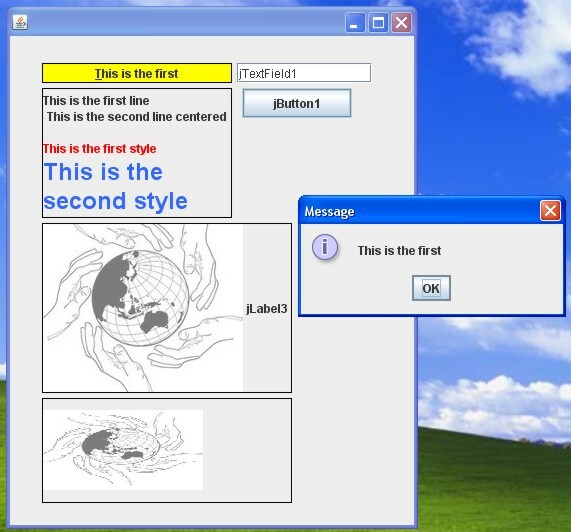 In dialog, choose option Image Within Project, select image file.Click OK.
To positioning text with image, use horizontalTextPosition and verticalTextPosition properties. 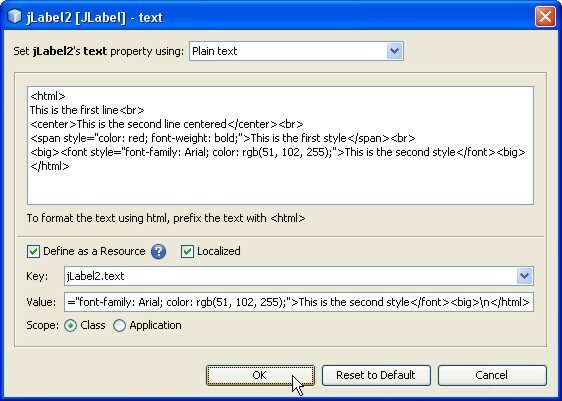 To remove text, select jLabel3, hit F2, delete the text. If the html-script is from an .html file, we would better using jTextPane component. In the next time we will discuss it in particular blog. 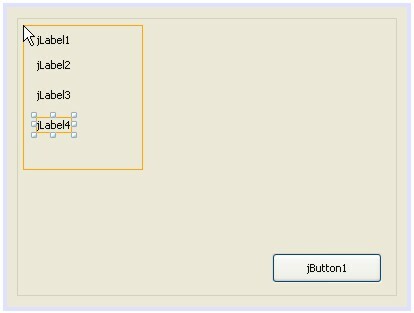 Right click jTextField1, select Change Variable Name… named tx1, click OK.
Click lb1 (jLabel), in tab Properties, subtab Properties, property labelFor, choose tx1. The result: when we press ALT+T, a focus will move to tx1. Right click jButton1, choose Events, choose Action, choose actionPerformed. Press F6, if lb1 doesn't change, close program. Click jButton1, then click OK.
Click ALT+T, focus will move to tx1. Thank you, please try it. 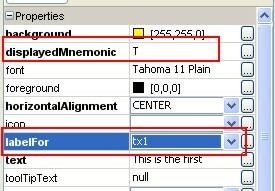 In the next blog we will discuss about jTextField, jTextArea and jPasswordField.